Lots of mentions and reviews today for The RESP Book. I have to say that I’m really happy with the coverage and praise that the book is getting. Thanks so much to everyone who is writing or telling people about the book. Chaya Cooperberg of the Globe & Mail wrote a great review of the RESP book. We spoke on the phone last week, and luckily she managed to edit my rambling paragraphs into intelligent quotes which you can read in the article. Mr. Holman’s highly readable guide to this complex account is a great resource for new parents, as well as for those who are ready to finally set one up for their kids. It was definitely an honour to see a review of the RESP book on one of Canada’s premier financial blogs. Ram is not afraid to write what he thinks, so a good review from him really means something. To be honest, most of the information available in the book can be found scattered between Government websites, newspaper articles, blog posts and forum discussions. But frazzled new parents will likely appreciate that the author has put everything together in one slim volume. Y&T is a relatively new blogger from Vancouver, who just spent a week in Hawaii. I would love to go to Hawaii! Anyways, she managed to read the book and create a review in the land of Lost. She is also hosting a book giveaway, so if you are looking for a free RESP book – then head over and enter! It is so well written, clear, no fuss, no fluff, no beating-around-the-bush and such a breath of fresh air. I learned a plethora of things about the RESP- it really is so comprehensive and complete (yet written very clearly and simply without any wasted words) that it IS the ultimate “complete guide” to RESPs for Canadians. Kerry Taylor (Squawk), who writes at Squawkfox.com, wrote a post for Sympatico which lists my book as an RESP resource. 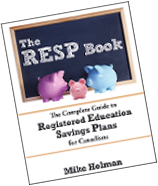 Check out The RESP Book: The Complete Guide to Registered Education Savings Plans for Canadians, by author Mike Holman, for an in-depth look at how RESP accounts work and how to get one started. Thanks for including my link 🙂 I learned so much from the book- it’s really IS great.. thanks for writing such a easy to read book. Thanks for mentioning my review Mike. It really does fill a glaring need in the financial bookshelf. Thanks guys – very nice.